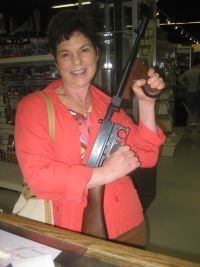 With shotgun shells as the only ammo on the shelf at Walmart and Joe Biden extolling the virtues of shotguns for self defense, I knew it was just a matter of time before my wife’s favorite gun shop reeled her in. Last year she got her CCW but she has been unable to practice due to the lack of 9mm ammunition. This week her favorite gun shop made her an offer she couldn’t refuse so “we” are now proud owners of a shotgun. If the objective of gun control legislation was to talk down gun ownership in America, the plan is having the opposite effect. Gun sales are booming. Now look what she is posing with! This entry was posted in Gun Contol and tagged guns. Bookmark the permalink.